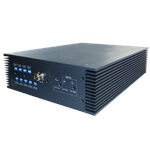 SureCall Force-5 signal amplifier is an alternative solution to a DAS but at a fraction of the cost. Modular in design, each Force-5 provides enhanced cellular and data reception for areas up to 80,000 square feet for over 100 users. SureCall Force 5 is full-featured signal booster that includes adjustable gain control and automatic shutdown for network protection. The Force5 combines performance, value and durability. Compartmentalized design increases clarity and reduces noise. SureCall three-year warranty is a testimonial to the quality. *Outdoor and indoor antennas and cables (LMR400 or CM400 recommended) are required for installation (purchased separately).